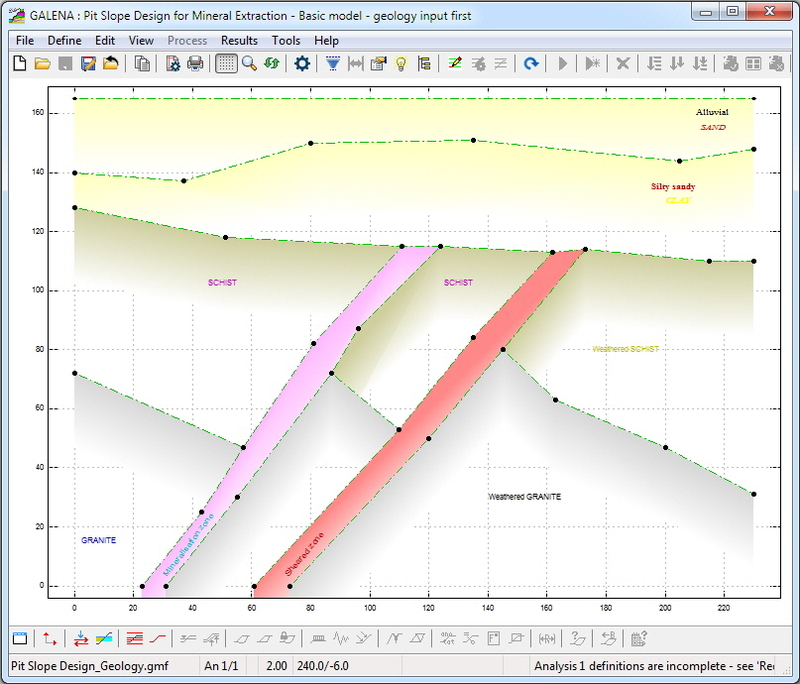 A unique feature introduced and only available within GALENA is in the area of material profile and slope surface definition, where the slope surface and material profiles are independent of each other. GALENA introduced and pioneered this logical capability to simplify modelling, and to save time and effort. GALENA allows you to define geology or slope makeup as it exists or will exist, without first defining the slope surface, thus providing for rapid assessment of design options. What this means is that the slope surface is entirely independent of the material profiles (profiles define geology or material layers), and can be moved, modified or re-positioned without changing, moving or re-defining any of the material profiles. ...Stability analysis shouldn't be an uphill battle! 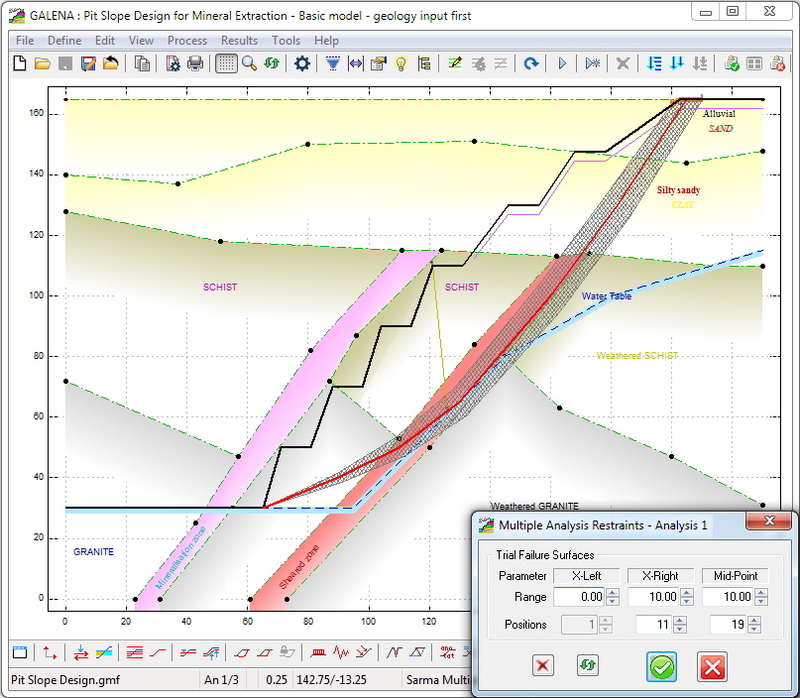 We should emphasis that it is not necessary for the user to remove or strip away any of the profiles or materials that lie above the slope surface when modelling in this way, at any time - that is handled entirely and automatically by GALENA. This capability led one well-respected observer to candidly comment "I can see why GALENA walks over everything else available to the mining industry". This image shows the model initially with geology defined first (using material profiles). Material properties have been defined for each material (the colourbars on each profile are associated with a material) and labels have been added to aid identification. 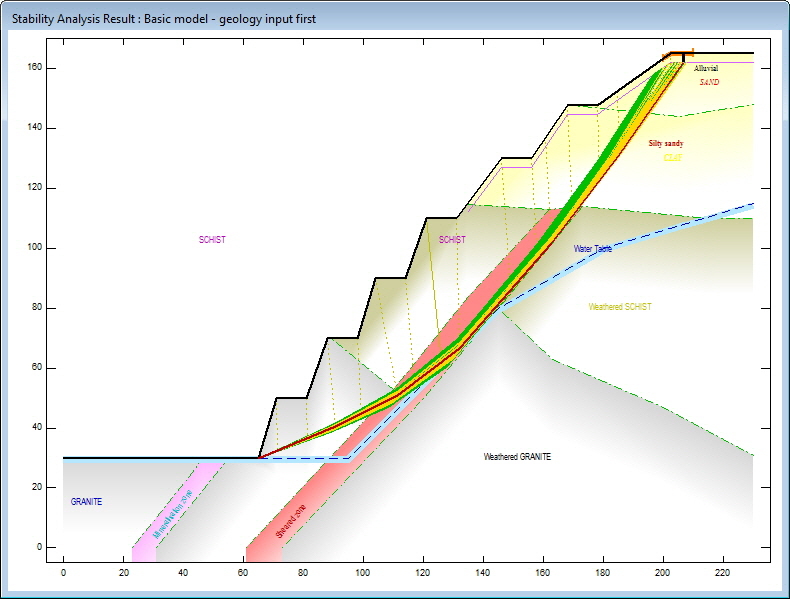 Then, as shown in the image below, the slope surface is defined (based on the mine plan in this case). Expected or known water conditions are then defined, along with an expected failure surface and analysis restraints for analysis. It should be noted that the slope surface is not tied to any of the material profiles in any way. Once definition is complete the model can be processed. The result image from analysis is shown below. Material profiles above the slope surface have been removed and are not shown, without any required action from the user. Material colours from profiles above the slope surface are projected onto the slope surface, for clarity.